We have a squirrel feeder in our front yard. 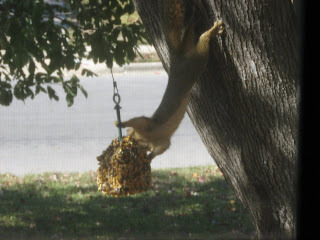 Today I was watching as a squirrel figured out how to get the corn. He would lean over from the tree, grab the cord and pull it toward him. However, he still found it easier to be upside down when he got the corn. He'd bite off a piece, let the block go, and scramble to the backside of the tree to crack open the shell of the corn and eat the inside. Clever squirrel! That is the longest squirrel I've ever seen. It's amazing his back legs can hold on. Yes, it's the size a 6mo old kitten. All the wild animals around our house are big because my husband feeds them. Doves are the size of small chickens. Good thing we live in the 'burbs or else hunters would shoot them.